Old and new buildings in "Over‐the‐Rhine"
The Sweet Stroll Tour by Cincinnati Food Tours will take you through Cincinnati's currently most up‐and‐coming area: the so‐called "Over‐the‐Rhine" neighbourhood. "Over‐the‐Rhine" was originally built in the 19th century – mainly by the many German immigrants who came to Cincinnati en masse during this time. Many residents had to cross a canal in order to get to work in downtown Cincinnati. This canal reminded the German immigrants of the river "Rhine" back home. Consequently, the Germans nicknamed the area they lived in "Over the Rhine". However, as a consequence of economic depression after World War II, the area became known as rough and dangerous. In the movie Traffic (2000), for example, a teenage girl can be seen going to Over‐the‐Rhine for drugs. 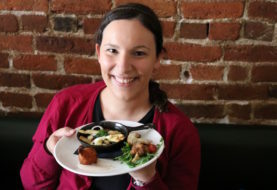 Cincinnati Food Tours was founded in 2012 by Barb Cooper after she and her husband Barry had opened a fresh produce and specialty shop located in Findlay Market – the heart of the "Over‐the‐Rhine" (or "OTR") neighborhood. What will I see and eat? The tour started off with a Belgium Waffle. 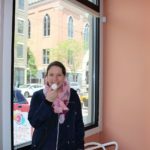 Located inside the Findlay Market hall, Taste of Belgium was founded by a businessman who emigrated from Belgium to Cincinnati (and brought with him several delicious Belgian recipes). Having tried "Belgium Waffles" in actual Belgium (Bruges to be precise), I certainly thought that the taste of this waffle came very close to the original. Especially because it was still warm. Yum! 2. Stop: The Candy Bar! The OTR Candy Bar is full of memorabilia for sweet treats – from the 1930s to the present day. 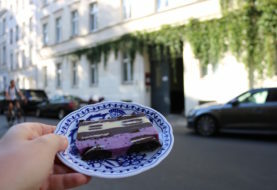 We tasted two pieces of hard candy here – one very chocolaty and one more fruity. Moving on, we passed by a beautiful mural that shows George Clooney's aunt Rosemary Clooney. A local from the area, Rosemary was a famous singer and actress in the 1950s. On this occasion, Barb gave us the inside scoop of contemporary filming locations in Cincinnati. Films that have recently been shot in Cincinnati and the OTR area include Carol (2015) with Cate Blanchett and Rooney Mara, The Killing of a Sacred Deer (2017) with Colin Farrell and Nicole Kidman as well as The Life and Death of John Gotti (2017), which stars John Travolta as a ruthless mafia boss. For more info on recent and current filming in Cincinnati, check out the website of the Cincinnati Film Commission. When German immigrants brought their "Brezel" to America, the "B" somehow became a "P". After a Belgium and a German treat, it was now time for something French. At the Macaron Bar, you can even take classes to learn how to make macarons yourself and while we were there, a macaron masterclass was just taking place in the open kitchen at the back end of the shop. Meanwhile, we got a taste of macarons "Cincinnati‐style", which each comprised of two almond meringue cookies concealed in a creamy flavoured ganache centre. I don't think I have ever had better macarons in France… Yummy! The 1215 Wine Bar and Coffee Lab proves that coffee, beer and wine indeed go together. For our sit‐down break here, we had the choice between a speciality coffee, tea, beer or wine. Here you can use the restrooms and get to know the other people on your tour a bit better. While drinking my hazelnut cappuccino at the bar, I got talking to another tour participant: a girl from Bremen, Ohio (a tiny village named after the half‐a‐million‐inhabitants city I live in: Bremen in Germany). Next up was a typical American donut shop with a typical German name – especially for my home area Lower Saxony in the Northwest, where most of the German immigrants to Cincinnati originally came from. Holtman's Donuts (derived from the German surname Holtmann) is immensely popular – especially at the weekends. But waiting in line was worth it. The donuts with their very creative flavours were indeed heavenly! For the last sweet treat on our tour, we had the choice between different little tarts, macarons, cupcakes, muffins etc. 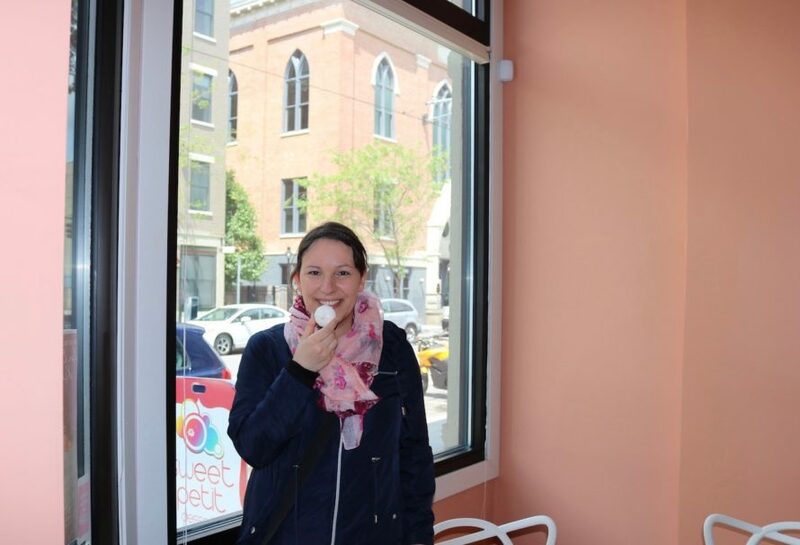 At Sweet Petit Desserts, we also listened to the story of owner Taren Kinebrew, who found her true passion in 2009 and consequently left the corporate world to start a small bakery business in OTR. … guide Barb will fill you in on the historical facts. Sure, I could have gone to all of these places myself. But without a guide, I would have never found all those little gems and I would have certainly not learnt that much about the history of the OTR area. Therefore, I thought that it was definitely worthwhile to take a tour and just be guided straight to the highlights of this dynamically changing area and city. Although those seven samples may not sound like much at first, they actually added up to a pretty filling, sweet breakfast. Towards the end of the tour, I even had to take some of the treats home with me, so I could enjoy them later. Ready for your sweet treat? The tours are really popular, so make sure you book ahead of time! 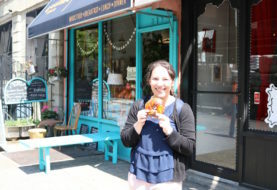 Disclosure: In order to write my review, I received a complimentary ticket for the Sweet Stroll Tour by Cincinnati Food Tours. The views expressed in this blog post, however, are entirely my own and reflect my personal, unbiased experience.